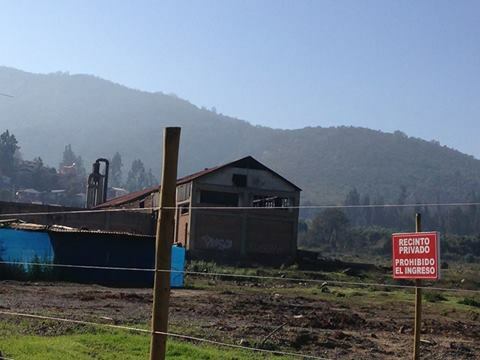 In a small town in Chile, a dark secret at the site of a former factory. For the second time since I arrived six weeks ago, friends have written me saying they’ve run across a Pinochet-era detention center in their neighborhoods. “Nothing out of the ‘normal’ in a country FULL of places where people were illegally detained and often tortured,” he adds. And he’s right: in Santiago alone, some 130 detention sites have been identified (http://www.memoriaviva.com), to the surprise of some neighbors and the unseeing eyes of others. I know, because the former Cuartel Lautaro Extermination Center is in my La Reina neighborhood. (Please listen to my audio, The Death Camp in Our Neighborhood at https://soundcloud.com/lshallat/the-death-camp-in-our-neighborhood-clean-version). A few weeks earlier I received a similar e mail from Natascha, in Limache, a small town about an hour outside Valparaiso. “About a month ago a large tract some five blocks from my house was cleared to make way for yet another supermarket. A derelict building known as the ex tomato factory Parma stands at the edge (see photo). Shortly after, the local station Radio Latina reported that human remains had been found on the site. I asked a long-time resident about it and he said that it was common knowledge the site was used as a detention center. He also noted the place has two large wells where they probably dumped bodies. “Another local man told me more,” she continues. “In 1973 he lived in a religious community with close ties to the local police. He remembers the police captain telling him the tomato factory workers were going to kill his grandmother. He said that the police believed the tomato factory workers were storing arms, and that a man who was teaching workers about their rights was detained and killed. The way he told it, the man was thrown out of a helicopter right here over the valley.